All that said, it became a turning point in my life because that was when I met my husband. We were both backpacking around Europe by rail. Our whole story evolved around the European rail. We met at a train station, traveled together all over Europe by train and said our goodbyes in a train station. If you watched the 1995 movie of Ethan Hawke & Julie Delpy entitled Before Sunrise, our story was like that but longer than a night because ours lasted for a month and a half. I'm not a romantic type but I have to admit that we did have a good start in our relationship. Before I start becoming soppy all of a sudden, let's go back to the pizze (pizzas). Back to Venice. The pizza in Venice arrived as a whole round pizza, big, like it was for 2 people. I thought the waiter was wrong in giving me the order. How could I possibly eat the whole thing when I am built like a matchstick? Then I saw the pizzas on the other tables. They were all the same size and from what I gathered (with a big surprise), one round pizza is for one person! After years of practice, I am proud to say that I can already finish one whole pizza too. Lesson learned. Round pizzas come only in one size and eaten by only one person, unless of course you want to share. They are usually served for dinner, not lunch, but nowadays, you can already find some pizzerie (pizza places) or restaurants serving them for lunch too. When I settled here, one of the first lessons I had was about pizza. My husband is short of being a fanatic of pizzas. Then fanatic number two was born and the third less fanatic was also born. I live with 3 pizza machines. On a regular week, we would have pizza twice on the average. 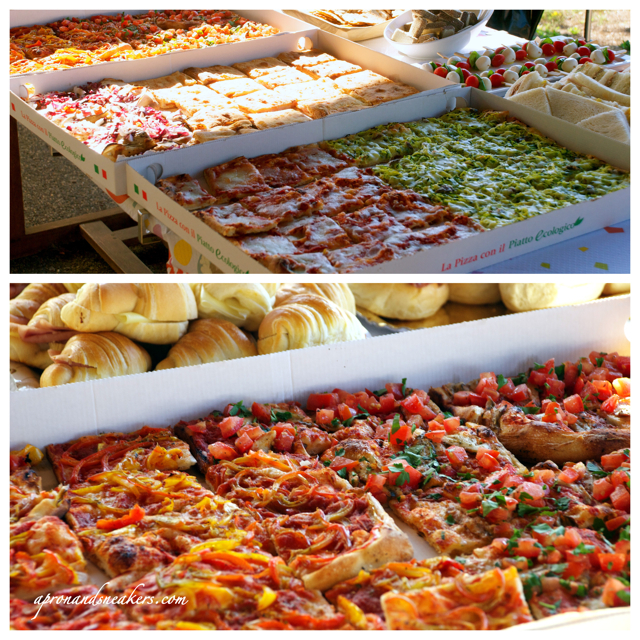 Sometimes pizze rotonde (round pizzas) for dinner or pizza al taglio (see pictures below) for lunch. 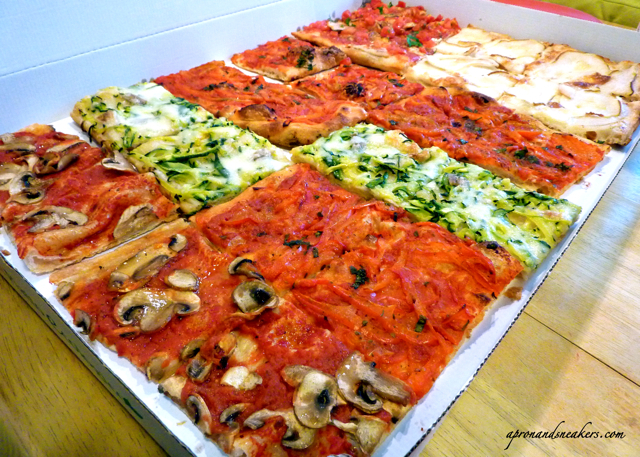 Pizza al taglio (pizza by cut) is basically a pizza fastfood found mainly in Rome. It's a small pizzeria with just a table or two and meter-long rectangular pizzas on display. You choose the kind and size of pizza (in rectangular portions) that you want, it gets reheated in the big oven, and you get the pizza cut in two pieces (usually), facing each other like a sandwich and wrapped with paper. Eat, walk & go. The other night, my husband suggested that I cook the pizza this time. I had been thinking about the same thing myself but was just a teeny bit reluctant because you know, you cook, you dirty around and you clean too. And pizza plates don't fit in the dishwasher. Well, that's it, it's out! It's an admittance to laziness. In fairness, I did enjoy preparing the pizzas with my own hands from scratch. There was a grand feeling of accomplishment. I prepared different kinds of pizzas. There was the white pizza with rosemary of Sofia, the red pizza with tuna of Riccardo that is usually mixed with artichokes or onions and mozzarella. It's actually one of my favorites. There was also pizza margherita (just didn't have fresh basil) and red pizza with oregano & pecorino. I thought mine was the tastiest & the best. 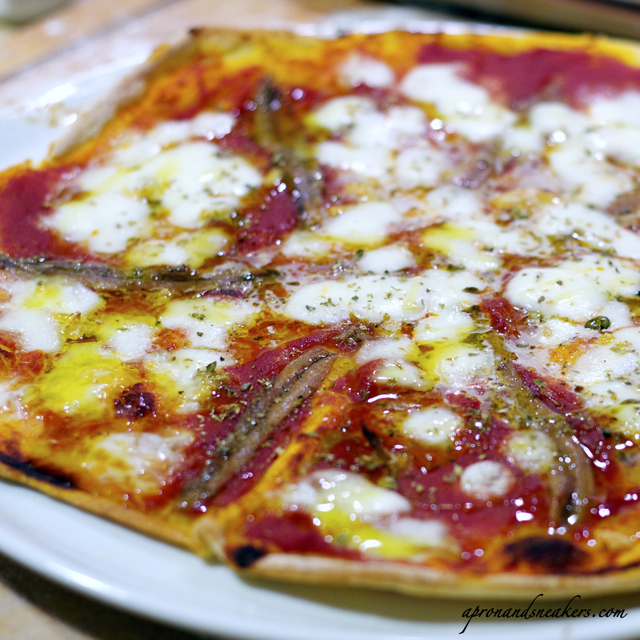 I prepared a red pizza with the anchovies I recently bought in Cetara (Amalfi Coast) and a sprinkle of fresh garlic. I had to close my eyes after the first bite. Goodness! Pizza al taglio that we took home for lunch. One good thing about making pizza at home is to be able to put whatever you want. You just go on and enjoy being creative. And making pizzas can be a group effort thing. Everyone can pitch in to creating the pizze (pizzas). Friends or families, it's always fun. I'm using this recipe that I picked up from friends whenever we make our own pizzas together. Boxes of pizza al taglio during a children's party at home. Make a little mountain of flour on a wooden board (or in a big bowl). Mix baker's yeast with the water. Mix until completely melted. Pour in the hole little by little. Use your pointing finger to mix the flour with the liquid. Start from the center going outwards in a circular motion. Add extra virgin olive oil. Add more water if necessary. Knead until you have a compact ball of dough. Put in a big bowl and cover with a cloth. Let it rise between 2 - 4 hours at room temperature. You can also leave it overnight. If you are in a hurry, put it in the oven at 35 degrees C for one hour. When the dough has risen, divide it into 4 equal parts. It should be elastic. Sprinkle wooden board with flour. 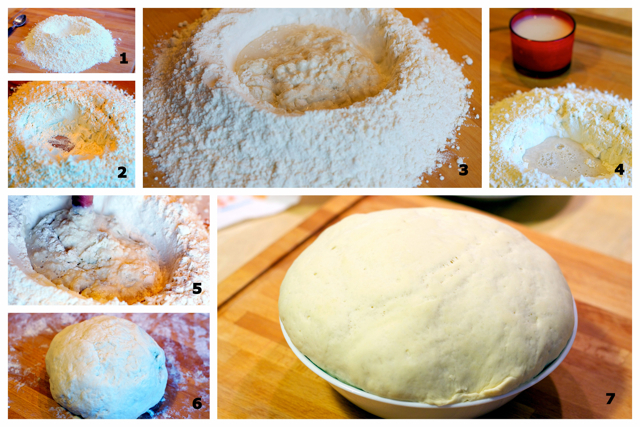 Work on each dough with your hands by flattening it with your hands and stretching the sides little by little. To see how to do it, watch this video that I picked up in YouTube. Or you can just use a rolling pin like I did. Oil the pizza pan. Transfer the flattened pizza dough on it. Prick it with a fork all around. Spread some oil on the dough using your hands. Sprinkle some salt. Put the toppings of your choice. 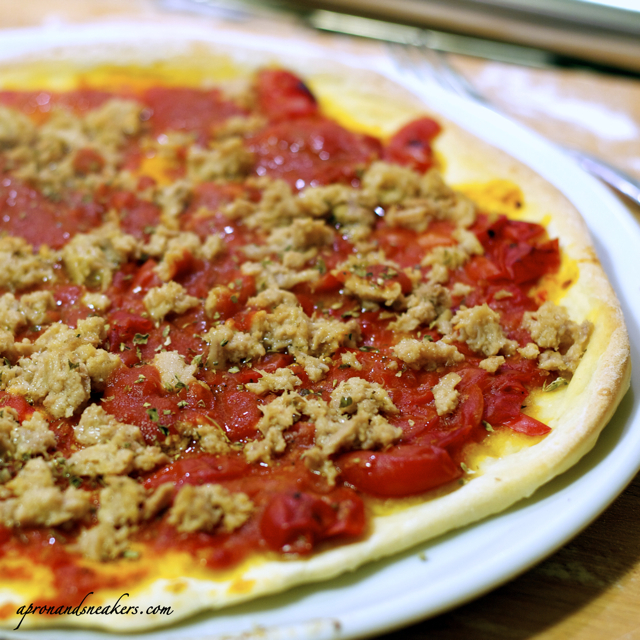 Spread tomato sauce on the pizza. Sprinkle with oregano (or fresh basil) & salt. Drizzle with extra virgin olive oil. Put in a pre-heated oven and cook at 250 degrees C for 9 minutes. Take out pizza, quickly add more tomato sauce and distribute the mozzarella on top. Put back the pizza in the oven and cook for another 3 minutes or until mozzarella is cooked. Some would put the mozzarella at the beginning of the cooking or at the latter part of cooking. Putting it at the end of cooking assures you that the cheese will not burn. Before serving, sprinkle some oregano (or fresh basil) & drizzle with extra virgin olive oil. Spread tomato sauce on the pizza. Sprinkle with oregano & salt. Drizzle with extra virgin olive oil. 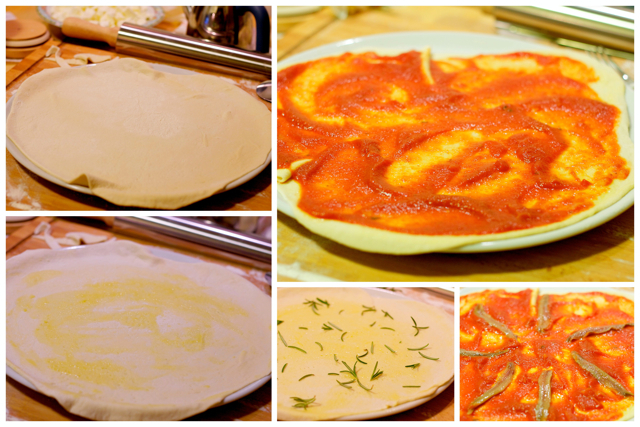 Take out pizza, quickly add more tomato sauce and distribute the mozzarella and pecorino on top. Spread tomato sauce on the pizza. Sprinkle with oregano & garlic. Put anchovies on top. Drizzle with extra virgin olive oil. Take out pizza, quickly distribute the mozzarella on top. Put back the pizza in the oven and cook for another 3 minutes or until mozzarella is cooked. Before serving, sprinkle some oregano & drizzle with extra virgin olive oil. The one I made doesn't have onions & mozzarella because my son requested it without. Putting onions & mozzarella is the usual composition. Spread tomato sauce on the pizza. Sprinkle with oregano & garlic. Put tuna & onions. Drizzle with extra virgin olive oil. 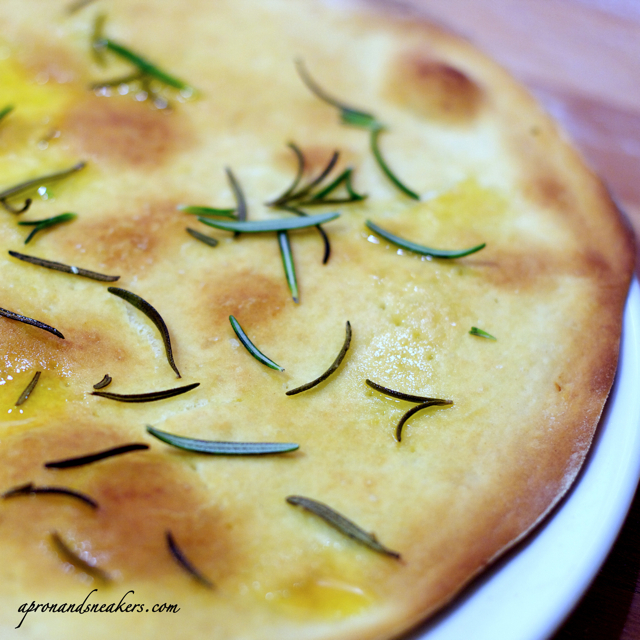 Drizzle the pizza with extra virgin olive oil then sprinkle with rosemary. 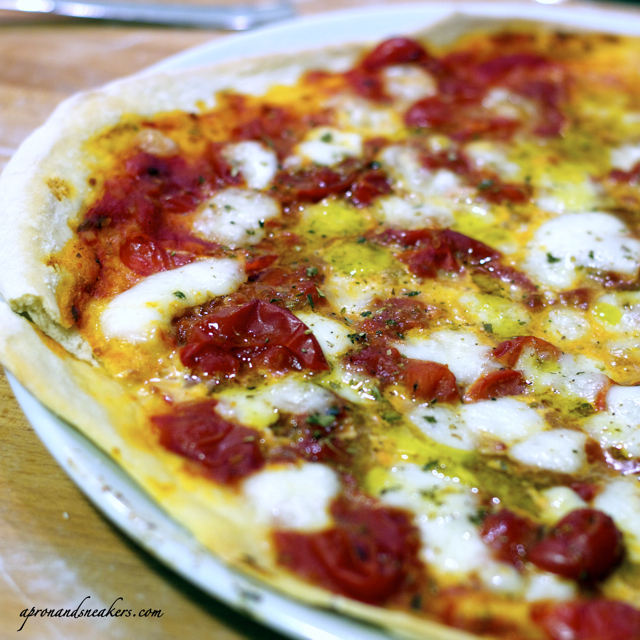 Take out pizza, quickly distribute the mozzarella & scamorza affumicata on top. Put back the pizza in the oven and cook for another 3 minutes or until cheese are cooked. 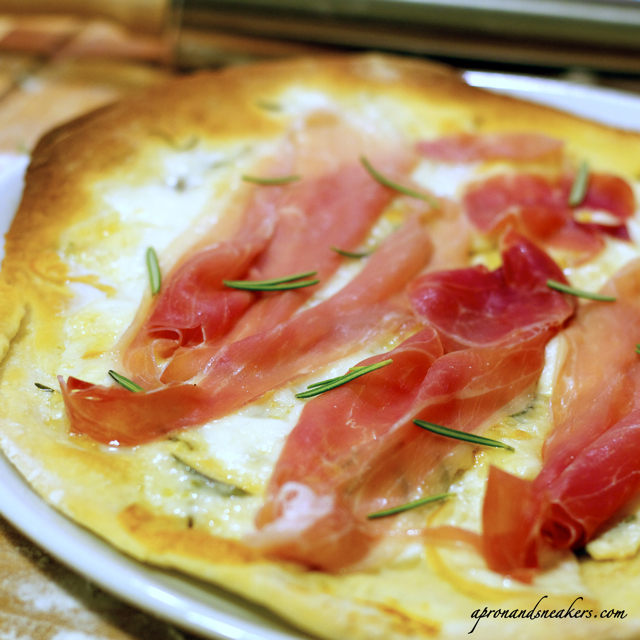 Before serving, put the prosciutto crudo on top, sprinkle some fresh rosemary & drizzle with extra virgin olive oil. Put in a pre-heated oven and cook at 250 degrees C for 12 minutes. Before serving, sprinkle some fresh rosemary & drizzle with extra virgin olive oil.